(NaturalSociety) Two scientists from the U.S. Centers for Disease Control and Prevention (CDC) who are not authorized to speak with the press have told Reuters that Michael Farrell, head of the CDC’s Bioterror Rapid Response and Advanced Technology Laboratory, will be reassigned as the agency investigates an anthrax scare. It is possible that as many as 84 employees at the Atlanta campus will be forced to be vaccinated or take powerful antibiotics with unpleasant side effects to ward off the potentially deadly anthrax disease caused by the bacterium Bacillus anthracis. This particular bacteria can form endospores that are able to live in harsh environments for many decades. The CDC’s Tom Skinner, a spokesman, declined to comment. When Reuters tried to contact him through email and by phone, they were ignored. The anthrax incident first occurred sometime between June 6 and June 13, but individuals in labs adjacent to the exposure area complained that they were not informed of a possible exposure, according to Skinner. During that time, workers in the bioterror lab were trying out a new protocol for killing anthrax before sending the bacteria to two lower-security labs for use. “Anthrax infects humans by touch, by inhalation or by consuming it. The inhaled form is the most dangerous, and among the 18 such cases identified in the United States during the 20th century, the fatality rate was around 75 percent, according to the C.D.C.’s website. After the terrorist attack in fall 2001 in which B. anthracis spores were released through the mail, five of the 11 people who were ill died,” reports The New York Times. The bioterror lab apparently sent the anthrax bacteria in closed tubes, but the recipients agitated the tubes before removing the lids, possibly freeing anthrax into the air where it could be exposed to hundreds of people. The scientists who spoke with Reuters believe the risk of infection was small since such a miniscule amount of anthrax was sent out of the higher-security lab, but on June 18th, a team of scientists swabbed all lab surfaces that might have been contaminated to test them. The first two samples were negative, but they continue to test. 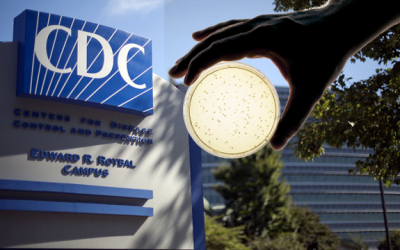 “We waited too long to inform the broader CDC workforce,” he wrote in the email obtained by Reuters.